They did a very good job. Nik, who did the work, was polite and friendly, got a lot of soot out of the chimney and didn’t leave a single spot of soot or dirt behind when he had finished. We have no hesitation in recommending them. 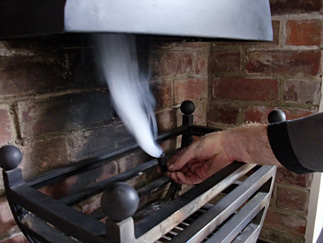 An open fire is a real pleasure but often people can have problems with a poorly burning fire. We can offer advice about this and also make recommendations on fuel supply and type and considerations when in a smokeless zone. If you’ve a question about your real fire just give us a call, we are happy to help.